What’s with the bling on the carriages these days? I’m guessing it’s some kind of safety regulation to ensure they’re visible at night? ← Previous Previous post: Perth’s CAT buses: lessons for Melbourne? I doubt if those lights are needed for safety. it’s probably just a marketing ploy – and has obviously worked! Some of them never used to have any lights. Some had a red battery operated tail light. The number of lights increased as LEDs became widely available. What’s wrong with a good ol’ mock lantern? And maybe obliging motorists to have a guy waving a red flag twenty metres in front! I think it looks kind of neat with all of the changing bright colors and a little bit tacky at the same time. It drastically increases the visibility of these slow moving vehicles. 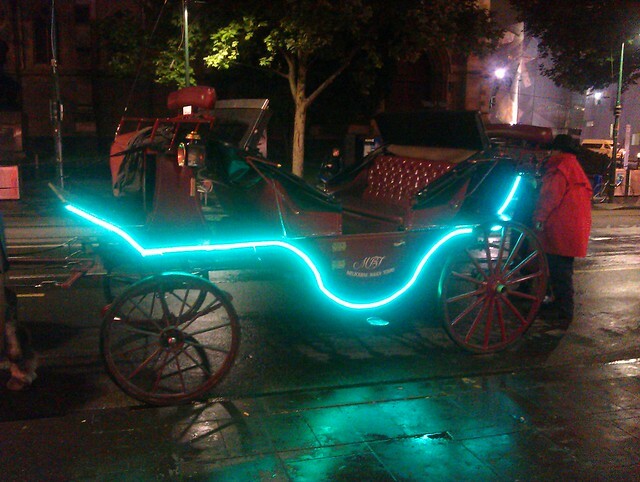 Some of these carrages have lights and other silly decorations on the horses too.